For the Love of Meg! Princess has a thing for the more obscure Disney movies and characters. I guess I only have my self to blame since I had a brainstorm after buying our second copy of Little Mermaid on DVD that if we watch sturdier VHS movies, our expensive DVD’s might last longer. So, some frantic bidding on Ebay later and we have a hefty collection of Disney movies on VHS. One of those is Hercules. Remember Hercules? It came out about 12 years ago and honestly I had forgotten about it. 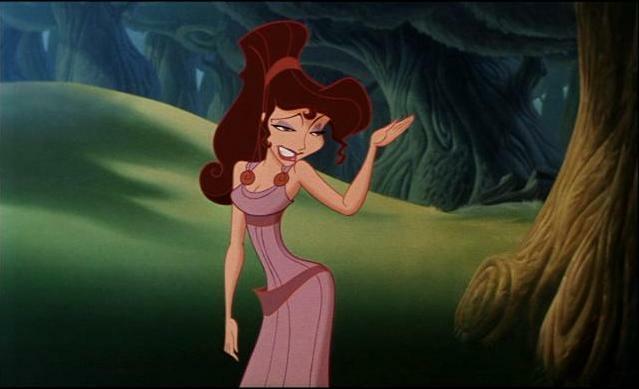 But Princess LOVES the tough, sarcastic girl, Megara (“My friends call me Meg, at least they would if I had any…”). So all she has talked about lately is Meg. Her imaginary playmate is always Meg and she loves to sing her song (it is SO cute!). However, this presents a problem for me. She obviously would love and want Meg toys, but how do you find them for an not-much-beloved movie that came out 12 years ago? Enter my favorite online savior, Ebay. 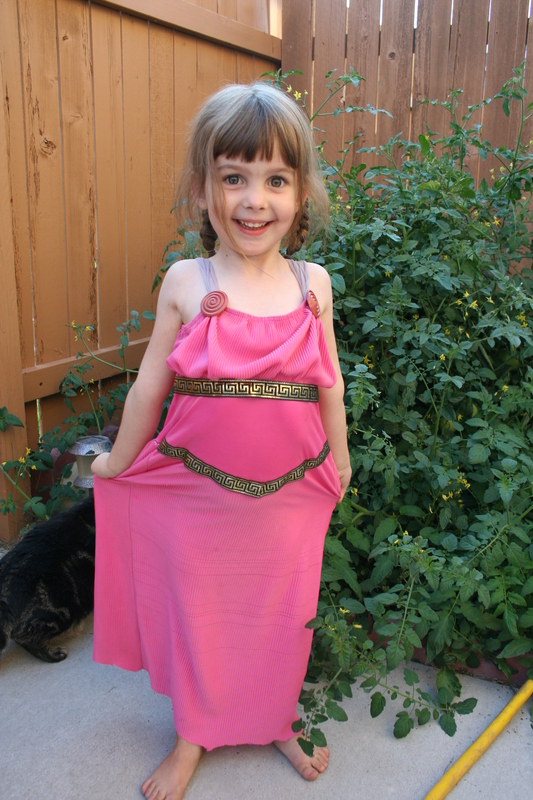 In the past it has helped me find such obscure things as a “Pink Kitty” costume (oct ’07) and has supplied my children with cute and inexpensive clothes and shoes for their whole lives. So off I went, searching madly for anything “Meg”. To make matters worse, she wanted a Meg and Hercules birthday party. I could have steered her towards something a little more, um, merchandised, but I’m an overacheiver and besides, there would be boys at her friend party so the boy-friendly theme actually worked out. I was able to find a mylar Meg balloon, and iron-on to make a shirt, and a Meg/Herc tablecloth and a lot of little McDonalds toy figures for her cake. But what I REALLY wanted to get was a Meg doll. THey are out there, but unfortunately, they are apparently a hot doll collector item and I wasn’t prepared to shell out $50+ for a used Meg doll. Hmmm, what to try next? 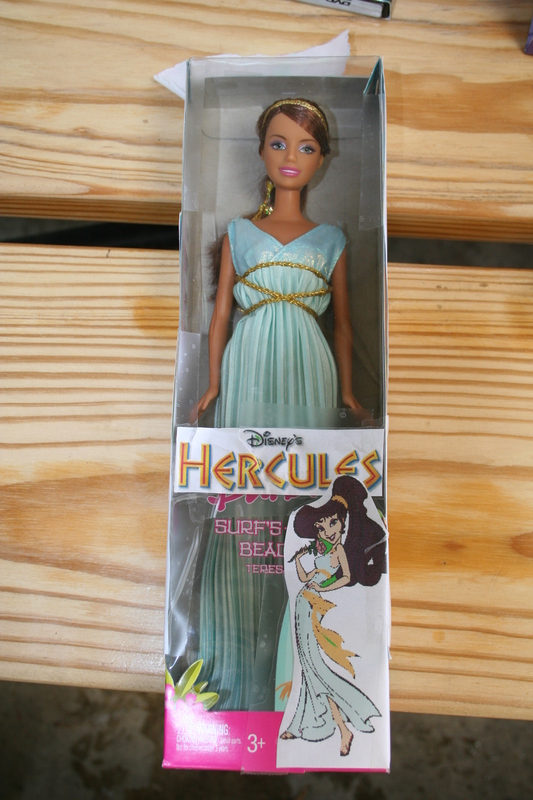 So I looked for “Greek Barbie”. She’s only 4, she won’t know better. No dice. I searched on everythign I coudl think of and couldn’t come up with anything. Notice how she even photoshoped out her shoes! October 30, 2008. Tags: disney, obsessions, Princess. Uncategorized. Terrific post. Shows you how parents can influence or discourage the character phenomena. I went so far as to make Jen her “costumes”. Remember Wendy? (she would only wear LONG dresses…all of the time and no collars or buttons! Of course in those olden days there wasn’t any store/Disney merchandise. 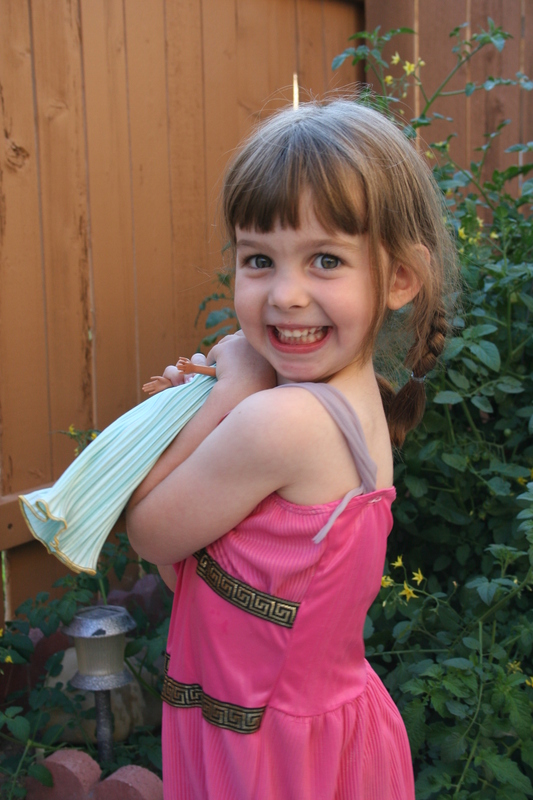 Obviously, Lily/Meg is one of a kind…and so darn cute!! October 30, 2008 at 1:05 pm. Permalink. great post! Shows us how much parental influence is in fostering the “Friend” passion. Enjoy it, it goes away so fast. Jen was the fanatic in our fam. I HAD to make her costumes…remember Wendy? She would only wear dresses, long with no buttons or collars. Back in the “olden” days there wasn’t any premade things available. Lucky Jen that her mom sewed. October 30, 2008 at 1:09 pm. Permalink. Oops! didn’t think the first one published and couldn’t delete the other. Oh well, it is 2 posts!! October 31, 2008 at 3:52 am. Permalink. Great post Mak! I love that Cyndi was able to pull that off. She is so talented! Just kidding. We know ours wasn’t the favorite. We’re just glad we actually got one off to her. What did she dress up for on Halloween? Meg? October 31, 2008 at 9:58 pm. Permalink. What are aunties for if not to grant the obscure wishes of nieces? I remember Aunt Mary getting me a Caboodles make-up carrier long ago for Chirstmas and I thought all my wishes had come true! November 3, 2008 at 11:44 pm. Permalink.